The Orthaheel orthotic technology was developed by deceased Australian podiatrist Phillip Vasyli in 1979. A pioneer and innovator in the field of lower-limb biomechanics, Phillip was known by friends and colleagues as a “born healer”. Unfortunately, his life came to a tragic end on March 24, 2015, when he was found stabbed to death at his home in the upscale Old Fort Bay neighborhood in Nassau, Bahamas. Donna Vasyli, his wife with whom he had two children, was charged with the murder. Despite the death of its founder, his company Vionic has continued growing thanks to the unique Orthaheel technology developed by Phillip Vasyli. With over 30 years of research and development, Vionic men’s and women’s sandals, slippers, active shoes, and casual flats promote natural alignment from the ground up. It is recognized by the American Podiatric Medical Association (APMA). A groundbreaking study shows that orthosis-shaped sandals are as efficacious as in-shoe orthoses and better than flat sandals for plantar heel pain. Transform your shoes with podiatrist-designed Vionic orthotic inserts that provide high quality, soothing support, reduced pronation, and increased stabilization and shock absorption. You can buy full-length or 3/4 length orthotic inserts at Amazon and Vionic. They can be used in a variety of shoes, including formal dress shoes and sneakers. If you’re still wondering what Orthaheel technology is, check out the following video that shows how it can help you relieve a variety of foot problems. Below we’re featuring just some of our favorite Orthaheel shoes. Which pair is your favorite? Veranda’s low-profile construction features a thin-wrapped footbed. Criss-crossing straps across the vamp are secured with a metal medallion, while a backstrap adds adjustability. 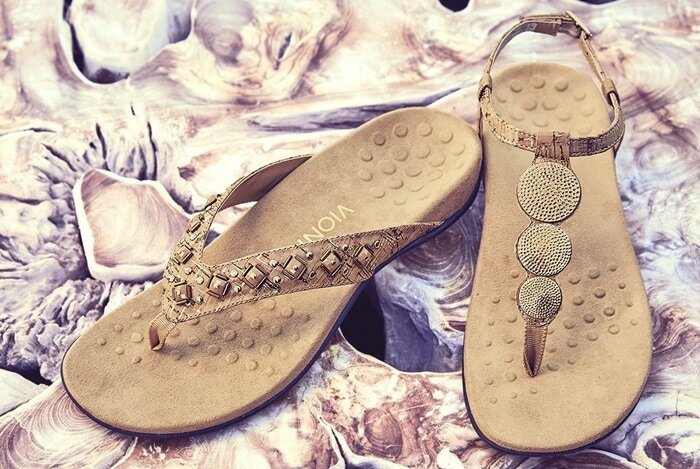 Hammered discs glint in the sun on this classically inspired thong sandal. The innovative Orthaheel technology provides superior orthotic support, relief, and stability which helps realign the feet back to their natural position.